The Yorkshire Philosophical Society is proud to announce the publication of a new book about York’s Museum Gardens, which it founded in 1828. The results of many years of research by co-authors Dr Peter Hogarth and Professor Ewan Anderson, this copiously illustrated book provides the definitive history from early times to the present day of this well-loved site at the heart of the City of York. “ ’The most fortunate situation’ sheds light on the extraordinarily rich history of this fascinating 12 acres of land from the creation of the Roman fortress, the prosperous time of the medieval Abbey of St Mary and subsequent dissolution under Henry VIII, the building of the Yorkshire Museum and landscaping of the surrounding site to create Museum Gardens, through to the present day and pondering the future. …. If you have ever wondered what the site looked like before the Yorkshire Museum was built, and what drove the creation of the Museum Gardens, and what the future may bring, then this is the book for you”. The book is dedicated to Dr Peter Addyman, YPS Vice-President, who has spent much of his life excavating and discovering the archaeology of the site and who has encouraged the research and development of this work over many years. The book will interest historians, garden-lovers, the many people who treasure family memories of visits to the Gardens and all those who enjoy this green oasis in the heart of York. Publication price is £25 if collected from the YPS Lodge Museum Gardens or add £5 UK postage. With the Society’s bicentenary approaching we now have a fitting legacy of YPS in the Gardens – a representation of a geological map celebrating the pioneering work of William Smith, the ‘Father of English Geology’ (to read about this click on the highlighted text). YPS retains a keen interest in the development of the Gardens and a small group of members meet from time to time in the Lodge – often with the Head Gardener present – to hear about the latest developments and discuss ways in which the Society can contribute to the ongoing development of the Gardens, especially as they enter an exciting phase of major expansion. 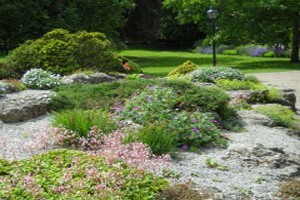 Any member interested in contributing to the Gardens Group please contact info@ypsyork.org.